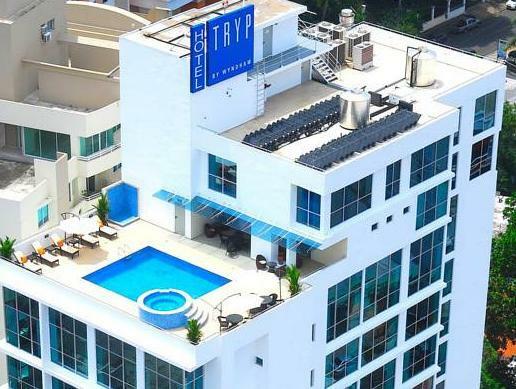 ﻿ Best Price on Tryp by Wyndham Panama Centro in Panama City + Reviews! Tryp by Wyndham Panama Centro is located 0.6 mi away from Panama town center and 10 minutes’ drive from Panama International Airport. It features an outdoor pool, fitness center and a rooftop with city views. Air-conditioned rooms offer free WiFi, a work desk, ironing facilities, flat-screen cable TV and a coffe maker. All rooms also have a mini fridge. The bathroom is private and has a hairdryer, shower and free toiletries. All of the rooms have city views. The on-site Gastro Bar at 5-0-7 is a vibrant restaurant with Mediterranean flavor. Shopping is available at the Multiplaza and the Albrook Mall, which are both a 10-minute drive from the hotel. Panama Canal is 7.5 mi away from the hotel and Panama Bay is 10 minutes’ drive away. Hotel is conveniently located just 820 feet from Metro station of El Carmen. Please be advised that the main swimming pool and Whirlpool area will be closed for renovations starting January 29, 2018 for approximately 6 days until February 3rd. Guests are required to show a photo ID and credit card upon check-in. Please note that all Special Requests are subject to availability and additional charges may apply. Please inform Tryp by Wyndham Panama Centro of your expected arrival time in advance. You can use the Special Requests box when booking, or contact the property directly using the contact details in your confirmation. Convenient location, easy to get around, helpful staff, nice bathroom with comfortable bed. The hotel is centrally located and close to the biggest shopping mall. Its easy to get transport from the hotel. The rooms are very nice, incredibly clean with comfortable beds and nice showers. The hotel has a restaurant, a roof top pool and an exercise room. The staff were very friendly and could speak English. The area around the hotel is safe for walking, there are a few convenience stores, a pharmacy, restaurants, car rental companies and stores.Everything is walking distance; metro was just one block down the street. Nice friendly staff and convenient location. Good value for your money. Overall, I had an enjoyable stay there. But, the evening front desk clerk was more into getting sleep than helping me. The bellman(security) guy had to whistle at him several times before he woke up. The taxi driver's at this hotel wanted more than the going rate (ripoff artists). So, I walked a half block down the street to the Veneto Hotel and used their taxi services (very trustworthy). At the taxi stand (at the Veneto), ask for "Bolo", he is very knowledgeable, trustworthy, and friendly. He conducts excellent tours and services to/from the airport. Reasonable location, clean and fairly quiet hotel. Was in a good state of repair and the room was spacious enough. Walking distance to some hang-out places and down the road from a casino, if that`s your bag. Would stay again. We were there overnight to start and end a tour, so did not do much around the hotel. The staff was helpful and the rooms were good. The air-conditioning was great after touring Panama and using other hotels. We really liked it. Particularly the pool. All taxi drivers knew it, and it is only a short walk to the party zone and has casinos in close proximity. I would stay there again. The hotel is modern and comfortable, and centrally-located. The breakfast was good as well. A decent value too. Everything was great for the value. Clean, good quality breakfast included and a very central location close to many things. I'd recommend. This hotel scores highly on all points. Friendly and knowledgeable staff, great breakfast, clean rooms with high speed internet and excellent value for money. The roof top bar and open air pool has a good view of the city and there are several good restaurants nearby. I would recommend his hotel to anyone visiting Panama. I reserved a King Deluxe room but upon check,in was told there were none available. No washcloths. Dirty iron that left black marks. Hotel was OK but I probably would not quickly recommend to anyone. Not special. The breakfast was not very good. There was not enough seating for a hotel that size. The food service area was also small and crowded. The selection of items was poor. I gave up and ate across the street. The sultry management staff could use some customer service training by the outstanding housekeeping staff. The hotel had a selection of private cars to take you where ever you wanted to go for 2 to 4 times the price of an easily hailed cab. This is saying a lot in a city known for terrible cab service. Cabs in Panama City do not have meters. the price is a negotiation every time you hail a cab. A fare might be $5.00 to get to an area and $10.00 to get back to the hotel. Panama city has an underserved reputation as a safe city. I have traveled to over 50 countries and do not feel very safe in Panama City. I would likely not come to Panama City again unless it was a business necessity and I would not stay at the Tryp Centro if I did return. I absolutely love my 3 weeks stay at Tryp Panama Centro because the staff was simply superb. They were attentive, spoke good English and was very helpful. The rooms are clean and housekeeping dept did an excellent job. The location was close to a mini grocery store and to many wonderful restaurants, especially ones near Via Argentina and Via Veneto. It was easy to catch a taxi outside the hotel. Am thankful for the daily breakfast with friendly wait staff who greeted me with a smile each day. Thank you all for a great stay! With all the facilities that the hotel offers, Tryp is definitely a great deal. It is centrally located and within walking distance to many of the nice restaurants, public bus stations, supermarket around Via Espana and Via Argentina area. The spa, pool and gym are located on the rooftop (with a great view of the city) and are open for 24 hours. Will definitely recommend to friends who are visiting Panama City! Essentially new hotel, in a good location, convenient to walking to many restaurants, etc. modern style, midrange amenities, but a bit pricy for Panama City. Comfortable room with nice city views. Staff very friendly and helpful, but check-in and check-out process is too complex and slow. Also, only few of the front desk speak English, so you need to be aware of that, if that is a problem for you. It was OK for me, with basic Spanish communication.